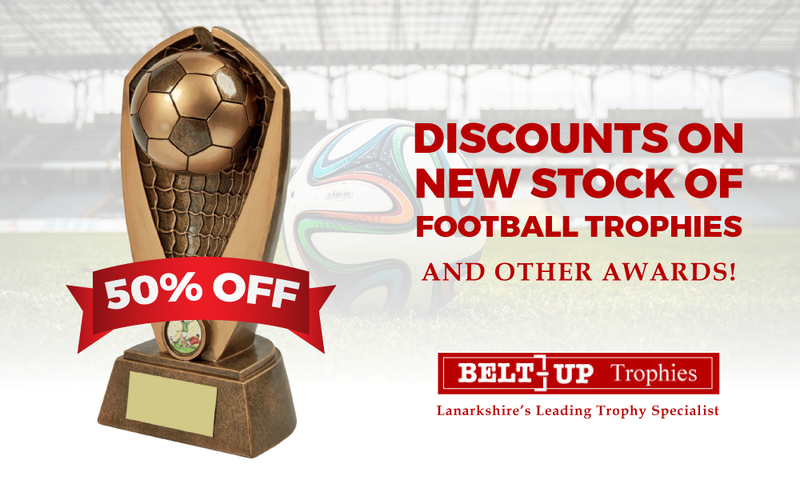 Check out our special offers page to see how much you could save on our Football trophies. With up to 50% off our collections, you could grab that corporate or team trophy for less today. We have a huge range of stock in store that we are constantly adding to. Come and visit us to find your trophy. With over 30 years’ trophy engraving experience, our family run trophy shop takes pride in providing a personal and professional service, for all your celebratory and commemorative gifts. We are located in Uddingston, in the south east of Glasgow, just off the M74 so are handy for all your trophy and engraving needs. We can help you out with all sorts of engraved gifts, keys and even replacing watch batteries. "I went into Belt Up today to get a new battery for my watch. They checked it over, got it working. They told me there was no charge. Made my day. Great wee shop, thanks guys!" "I have dealt with this family shop in the past. I received excellent service, today was no exception, Alan was helpful and gave excellent service and delivered engraved trophies in 4 days at short notice. Excellent value and advice by all the family." "Had amazing service from Tommy and Alan! Would highly recommend them for any kind of engraving." "Top guys Tommy and Alan. Don't walk by, give them a try!" We’re a family trophy shop, so quality and friendliness are among our top priorities. We have years of experience helping customers in the surrounding areas with a variety of services. You can hear from our happy customers in our review section. You always know what you’re getting when you come to our trophy shop, reliable service with a smile. We have all of the expertise required to perform all of the services that we offer to our exacting standards. If you’re looking for custom trophies then take a look at our catalogue or come down to our trophy shop to see them for yourself. Alternatively, you can feel free to bring in a trophy and we can take care of the personalisation element for you on request. Like our page on Facebook to keep up to date with our latest special offers and new arrivals in store. You can take a look at our page here or join us on Facebook by visiting www.facebook.com/beltuptrophies. We also have a full special offers catalogue available on our site. Click the link below to view the catalogue.